We rang in 2013 with yelling, dancing, and wild gestures. Contrary to what it sounds like, we weren't at a wild party ir nightclub. It was actually just a pretty normal night for us and six of our friends, including my sister and brother-in-law. I mentioned in this post that we were participating in a progressive dinner for NYE, but what I didn't tell you is that in addition to rotating houses for each course, we were also deep in the throes of a major competition all night long. It was 'battle of the sexes' and we played a different game at each house--from Just Dance competitions on the Wii to crazy Minute to Win It competitions to Darts to Guesstures. There was a lot of bantering, even more laughter, and only one champion at the end of the night. I'd rather not talk about who the victors were, so instead I think I'll tell you about this salad I served! I make a ton of salads and yet, surprisingly, one of the classics--caesar salad--is one that is absent from this blog. I don't ever make it, most likely because I overdosed on it in my adolescence when that was all I would ever order. I was intrigued by this version from Food & Wine, which flip-flopped the salad a bit, eliminating the croutons and instead serving the salad atop a piece of toasted, garlicky bread. This, along with a fantastic homemade dressing (no egg or mayo! ), made it a bit more special and unique than many caesar salads. Served with homemade French onion soup and some of our Scribe wine, it was just the thing to fuel us for a night of more eating and intense game playing! 1. Preheat the broiler. Brush both sides of the bread slices with olive oil and place on a rimmed baking sheet. Broil the slices for 3 minutes, turning halfway through. Bread should be slightly crisp and golden on the edges but still slightly soft in the center. Rub one side of each slice with the halved garlic. 2. In a small bowl, whisk together the minced garlic, lemon juice, anchovy paste, Dijon, Worcestershire, and capers. Gradually whisk in 3/4 cup olive oil and season with salt and pepper. Set aside. 3. 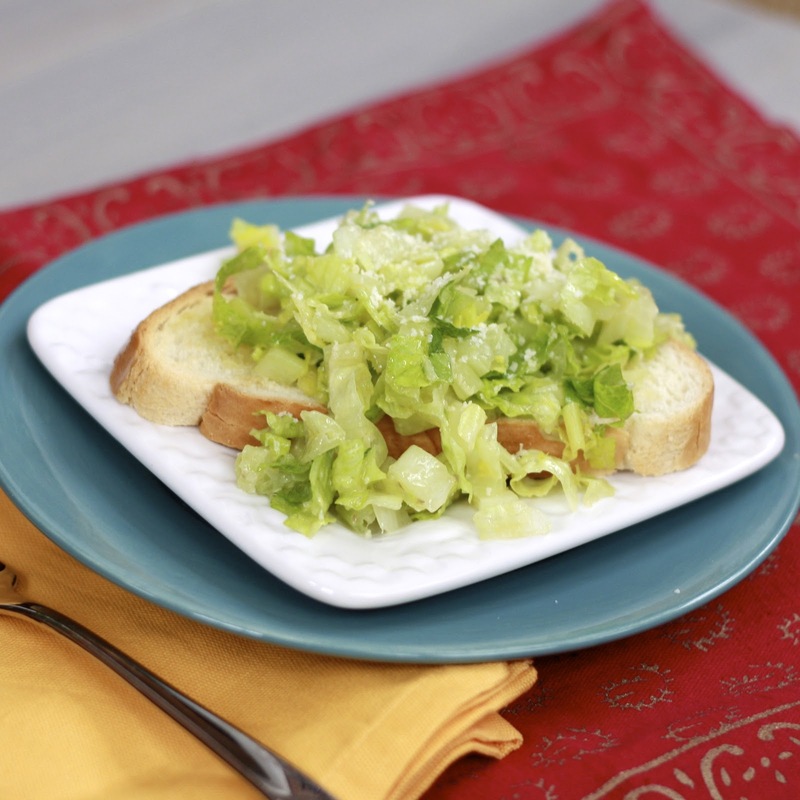 In a large bowl, toss the romaine with the Parmesan and dressing. Season with salt and pepper. 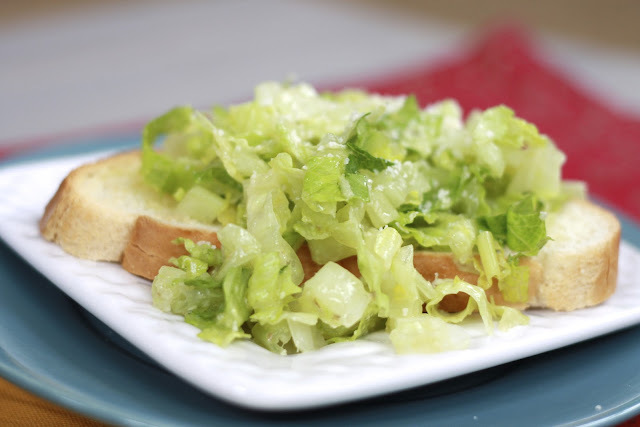 Mound the salad on top of the toasts and garnish with additional cheese.